President Recep Tayyip Erdoğan gestures as he talks with U.S. President Donald Trump at the start of the NATO summit in Brussels, July 11. A Turkish delegation left for Washington yesterday as a preliminary understanding was reached between Ankara and Washington over sanctions that caused a political dispute, diplomatic sources said yesterday. The two countries have agreed to continue discussions in a face-to-face meeting, which will include a nine-member Turkish delegation, with three members each from the justice, finance and foreign ministries. The Turkish delegates arrived in Washington last night and are expected to begin holding meetings as early as today. According to the sources, both U.S. and Turkish officials have reiterated their willingness to develop diplomatic relations and resolve problems, further expressing mutual appreciation for upholding diplomatic dialogue and constructive attitudes. 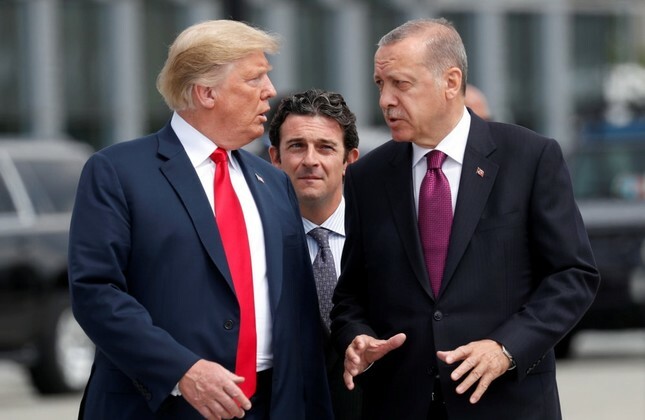 Relations between the two NATO allies deteriorated to an unprecedented extent after Washington decided to impose sanctions on Interior Minister Süleyman Soylu and Justice Minister Abdulhamit Gül over the detention of terror-linked Pastor Andrew Brunson. Ankara called on their counterparts in the U.S. to come to their senses as they deemed the actions illogical and have been trying to solve the matter through diplomatic channels. Following the U.S. sanctions, President Recep Tayyip Erdoğan announced that Turkey had decided to freeze the Turkish assets of two U.S. officials in retaliation. Late yesterday, the members of the delegation to be sent to the U.S. were chosen. It was announced that newly appointed Deputy Foreign Minister Sedat Önal will lead Turkey's delegation in the meetings. Önal was a former Foreign Ministry deputy undersecretary and also led the Turkish delegation at meetings on March 8 and 9 addressing the situation in Syria and the northern town of Manbij. A State Department spokesman told Daily Sabah yesterday that Çavuşoğlu and Pompeo had a phone call, possibly about the sanctions. The phone calls were conducted prior to the announcement of the preliminary deal. A Turkish source confirmed that that there had been two phone calls between the foreign ministers, possibly on bilateral sanctions. The U.S. Embassy in Ankara published a statement on social media yesterday and said the U.S. will continue to be a solid ally and friend of Turkey despite the tension. The U.S. and Turkey have an "active economic relationship," it said on Twitter. The statement said it was "unfortunate" that certain Turkish media sources had cited an American entity's estimate that the U.S. dollar would hit seven against the lira, calling it "a fabricated and unfounded lie." Pundits and Turkish officials have said that the White House has been using the Pastor Brunson case to increase President Donald Trump's popularity in U.S. domestic politics. The Turkish government has also said that the issue is governed by judicial process, in which the government cannot interfere. Former Deputy Assistant Secretary of State for Democracy, Human Rights, and Labor Rob Berschinski said the Trump administration "disproportionately emphasized" the Brunson case due to concerns in domestic affairs. "Considering that Brunson is an evangelical priest and the U.S. has been less aggressive on the other U.S. citizens detained in Turkey, it is not hard to say that the U.S. administration is trying to satisfy its supporters by wielding the Brunson case," Berschinski said to Deutsche Welle. Foreign Minister Mevlüt Çavuşoğlu said several times that Turkey wants to resolve issues with its ally. He had a meeting with his American counterpart Mike Pompeo in Singapore on the sidelines of the ASEAN summit, which he described as "constructive." "There might be problems between our countries, and there will also be dissidence; however, Turkey always wishes to resolve these issues via diplomacy, dialogue and mutual understanding," Çavuşoğlu told reporters after his meeting. "Since the beginning, we have said that a solution cannot be reached by using threatening language and sanctions," he added. President Erdoğan told U.S. President Donald Trump in a phone call in late July when he was in South Africa that the United States' actions were not appropriate. "Everyone is hurt by such tensions. Not only us, but the U.S. could also be damaged," Erdoğan said. Following the announcement of the sanctions, Turkish political parties, the business sector and nongovernmental organizations took a unified stance against the decision of the Trump administration. Brunson, who was previously jailed for his links to the Gülenist Terror Group (FETÖ) and the PKK, was released from prison on July 25 following an appeal by his lawyer, who objected to his extended detention in an earlier hearing, citing health problems that the 50-year-old defendant suffers from. Brunson is a Christian pastor from North Carolina who has lived in Turkey for more than two decades; he was indicted on charges of helping FETÖ, which is responsible for the failed 2016 coup, as well as supporting the PKK terrorist organization.